Click here to download our April-June newsletter. Quilting and Decorative sewing techniques. Serging ahead with extra feet. Learn to use the advanced features on your new sewing machine. This class is designed for "New Owners" of the Pro-Stitcher or those who are considering purchasing the Pro-Stitcher. We'll explore some of the more basic functions of this powerful software: capabilities such as repositioning, resizing, repeat, and area fill. Students will learn to set up an entire quilt with an edge-to-edge design. We will learn how to use the digital ruler and how to use the various repositioning tools. 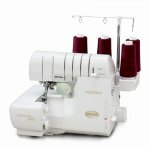 Know what to do if the thread breaks or if the bobbin runs out in the middle of a pattern, Understand how to use the resizing tools, and see how to use horizontal and vertical channel lock. Come with your questions too!